I don't know about you, but I tend to use Amazon on a daily basis. From doing product research and buying gifts to purchasing books for my Kindle, and watching videos and TV shows online. And with Amazon's recent purchase of Whole Foods Market, I'm sure they'll soon be delivering my groceries too! The good news for you is with all of Amazon's expansion comes a flood of at-home jobs and money-making opportunities! If you'd like to get in on Amazon's money-making empire, here are some great ways to do so. The Amazon Advantage program is for publishers, studios, authors, music labels and other content owners who want to sell their products (books, albums, and videos) through Amazon. There is an annual fee of $99 to become a member of Advantage and members set their own list price and receive a 45 percent return. Amazon Advantage is a consignment program, which means content owners are paid monthly, but only when their products sell on Amazon. The Advantage program is not for reselling used items, and it's not for independent publishing. CreateSpace is Amazon’s independent publishing company. Authors can self-publish their book through CreateSpace for free. Promotion and distribution through CreateSpace are also free, and each author sets their own list price. Authors earn a royalty percentage each time CreateSpace prints a new book to fulfill a customer order via Amazon.com. Royalties are calculated based on specifics of the book such as the number of pages, print color, size, and list price. Self-publishing can be a great way for authors to earn a higher percentage of royalties from book sales since they’re in charge of promotion and distribution (as opposed to a traditional publishing house). Kindle Direct Publishing offers authors the option to self-publish directly to Kindle. With KDP, authors create their own e-book using their own manuscript and cover. Content is uploaded right to the KDP program (provided it meets all content and quality guidelines). Authors retain control of their rights and set their own list prices. After writing a description and setting up the book in KDP, authors can expect their books will appear in Kindle stores within a day or two. Authors can earn up to 70 percent in royalties on sales. Kindle Direct Publishing also integrates with CreateSpace, so e-books published on Kindle Direct Publishing can also be printed in paperback form. Books are printed on demand, so they never run out of stock. Paperbacks through KDP are distributed through Amazon sites in the U.S., Europe, and Japan. Authors set their own list price can expect to earn up to 60 percent in royalties on the list price of paperback books, less the printing costs. With Amazon Associate (Amazon’s affiliate program), bloggers and publishers earn a percentage of sales from the product(s) they promote on their sites. For example, when creating a DIY tutorial blog post, a craft blogger may use an affiliate link to link to a specific type of paint or supply. The link directs the reader to the product page on Amazon. When the reader purchases the product, the blogger gets a percentage of the sale, usually 7-10 percent. Do you have a decent-sized social media following on YouTube, Instagram, Facebook, or Twitter? Then apply to be part of the Amazon Influencer Program. With this program, you'll receive a customizable page on Amazon and a vanity URL to showcase your Amazon product recommendations. The Amazon Influencer Program is an extension of Amazon's affiliate program, so you'll earn approximately 7-10 percent commission on items sold through your page/links. To get a better idea of what this program looks like, check out The Work at Home Woman's Amazon Shop. ACX allows writers to self-produce audiobooks and offer them for sale on Amazon, Audible, and iTunes. Authors have the option to narrate their own books or find an interested narrator and producer for hire through ACX. Authors can choose to be paid a flat rate or via royalties from sales. ACX also offers a $50 “Bounty” program where rights holders earn each time a new Audible member joins and purchases their book. MTurk is an online marketplace where businesses and developers can connect with workers to get small tasks completed on-demand. Human Intelligence Tasks or HITs are listed for workers to choose from. Many of the tasks are simple, rote work, such as differentiating between two images or categorizing products. Workers typically earn a few cents per task, which is deposited into their Amazon Payments account. Tasks may take anywhere from a few clicks to a few minutes and pay is scaled accordingly. Workers who have specific qualifications (such as legal or language skills) may be eligible to complete higher-paying tasks. If completing short tasks sounds like the perfect gig for you, check out this list of companies that offer these sorts of positions. With warehouses all over the world and new products added every day, Amazon is growing at an accelerated pace. Their business runs on technology, which means they have many opportunities for remote and flexible jobs within Amazon Corporate. Positions range from assisting with Amazon’s internal operations and employee relations to customer service and fulfillment. Bilingual positions are available, as are IT support roles, and international positions. Earning potential is based on experience, position, and availability. Fulfillment by Amazon (FBA) provides a way for sellers to not only sell their products on Amazon but to also use Amazon’s delivery and fulfillment services for their products. This includes Amazon Prime: Amazon’s popular free-to-members 2-day shipping service. A seller sends their products to Amazon’s fulfillment warehouses located around the world. Then, for a fee, Amazon handles product storage and shipping to customers. Sound like an interesting way to make money? Check out Tracy's story and find out how she earns $1,200 a month selling through Amazon's FBA program. Crafters and artisans can now sell their goods through Amazon Handmade. To be approved as a seller, all products must be hand-crafted, hand-assembled, or hand-altered. Artisans selling via Amazon Handmade can also take advantage of Amazon FBA and Amazon Associates programs. Artisans set their own prices and there are no listing fees. However, there is a $40 monthly membership to join the Professional Selling Plan, as well as a transaction fee of 12 percent (which is also applied to shipping costs). Merch by Amazon is a way to create, promote, and sell branded merchandise. Artists and designers can have logos and artwork printed on merchandise like t-shirts, hats, coffee mugs, and tote bags. Artists upload their work and Merch by Amazon handles the printing, production, and shipping. Merch by Amazon allows artists and designers without access to the large-scale production aspects of printing t-shirts and other merchandise to promote, share, and sell their work. Merch designers earn a royalty percentage (typically around 15-20 percent depending on the printed item). Merch sets the minimum list price for products. Due to its popularity, at this time Merch only accepts new artists by invitation. One somewhat unconventional way to earn money on Amazon is by selling private label items through the FBA program. Sellers search for generic products that can be sourced cheaply through bulk suppliers like Alibaba and sold under a private label for a higher price. This requires market research on hot-selling items, working through a supplier to purchase in bulk and adding the seller’s own logo, design, and packaging. After the initial startup cost (depending on the cost of the inventory, packaging, and design), private-label products can offer a great return. While returns vary by product and popularity, aim for a profit margin of around 50 percent. Amazon offers developers several methods for selling apps through Amazon. Developers can create apps for the Kindle Fire, Amazon Fire TV, and Alexa, as well as for select Android devices. Amazon also offers opportunities to monetize apps and games by selling physical products through your apps or creating digital in-app purchases, earning up to 6 percent per transaction. Those who are interested in this program can apply for a free account with Amazon, then follow the guidelines set forth on their website. Amazon Flex pays drivers to deliver packages using their own vehicle. Amazon Flex is not an at-home job, but it provides flexible scheduling. Drivers choose their own block of hours to work, then pick packages up from a local Amazon Fulfillment Center or area business and fulfill the deliveries. The Amazon Flex app records package information, deliveries made, and it even provides delivery route information. Amazon Flex drivers earn $18 -$25 per hour and earnings are based on the speed of delivery and ability to get customers their packages through the Prime Now program. You can find out more about the Amazon Flex in Anna's review here. The Amazon Trade-In Program gives consumers the opportunity to exchange eligible pre-owned items for Amazon credit. Amazon provides customers with a list of items they have previously purchased from the site currently eligible for trade-in. Trade-In participants may also browse thousands of popular items they may have purchased from other retailers that are eligible for trade-in as well. To submit an item for trade-in, participants browse the list to find their eligible item, and fill out a submission form. Amazon provides a convenient shipping label for sending in the merchandise for trade. Once the item is received, the participant is given credit on their account to use toward future Amazon purchases. See how this woman traded in her used textbooks for gift cards using this program. While you will need to open an account on Amazon to participate in their programs, this should only be created through secure websites like the ones listed above. As always, never give out your personal information to unsolicited personnel over the phone or via email. Amazon offers a lot of great opportunities to earn money. 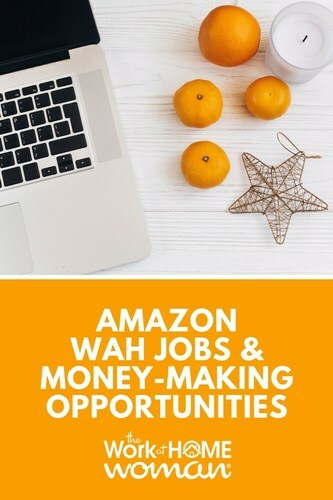 If you’re looking to supplement your income or build a full-time business consider one of these many options for making money and working from home with Amazon! Do you earn money with Amazon? If so, drop us a note we would love to hear from you! I trying to find out if Amazon has Real work at home jobss I would to know how and where do I apply! Just click on the links above to get started. I am interested in working from home for amazon. Details on how to work with amazon from home please! I am really looking to work for Amazon at home working as a customer service representative. How would I begin? I live in Charlotte, NC. Head to this link: https://www.amazon.jobs/en/locations/virtual-locations and check out what jobs they are currently hiring for. I am interested in working at home with Amazon! Please send info, thank you! All of the information is above — click on the links to get started. Just click on the links and they will take you to the respective page.